New Albion signing Markus Suttner is looking forward to the challenge of playing in the Premier League after joining the club this morning. The Austrian left-back has joined on a three-year deal from Ingolstadt and said: "I am always prepared to fight and work hard, and I have been told that team is filled with good characters, who have fought together to achieve what they have and I am really happy to become part of the team. "I have a 100 per cent passion for success and want to be a leader on the pitch. I will play how the manager wants me to play. If he wants me to attack then I will and if I have to stay deep, then I will do this. I will do what the manager wants and what the team needs. "I had a good season last year and now in this stage of my career, it's perfect to play in the Premier League, and the challenge for Brighton is a similar one to the one I first encountered with Ingolstadt." Suttner represented Austria at Euro 2016 but has now retired from international football. 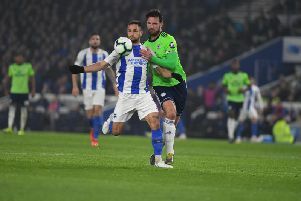 He was keen to sign for Albion as soon as he heard of their interest and said: "When I heard that Brighton was interested in me, I thought about it and it was clear I wanted to sign for Brighton. "It's a very good move at this time in my career, and I don’t have words to describe how happy I am to have signed the contract. I'm excited and keen to meet the players and start training."